This walk: 2010-12-8. Plymouth Leat, Drake's Leat, clapper bridge, Clearbrook, The Skylark Inn, pony, South Devon & Tavistock Railway, Clearbrook Halt, bridges, River Meavy, Yeoland Consols mine, Sheep's Tor, granite trough, Devonport Leat, horse drawn tramway, Plymouth & Dartmoor Railway, Sir Thomas Tyrwhitt, Tyrwhitt's Wharf. Hardy Strollers, testing the ice, it was a cold day. Clapper bridge over the Plymouth Leat, also known as Drake's Leat, looking towards Yelverton: 18 miles long, opened in 1591 as a simple ditch 6-7 feet wide, originating from a simple weir on the River Meavy (the site is now under Burrator Reservoir). It was lined with granite in 1871 and further improved during WW2 as a precaution in case Burrator Reservoir was bombed. The bridge, looking towards Plymouth. Frozen pond on Roborough Common. Clearbrook village, with The Skylark Inn (next-to-last building at right end). There are 51 houses, the hamlet being about 200 years old, inhabited originally by miners and labourers, started by a syndicate that included George Frean who was also the builder of the Powder Mills. Either Frean or the syndicate supplied biscuits to the Royal Navy. George Frean went into business with James Peek in 1857 in Bermondsey to form Peek, Frean & Co., biscuit makers whose products included the Garibaldi and Custard Cream biscuits, now known as the Bourbon biscuit. They amalgamated in 1921 with Huntley & Palmers although each kept their own brands and identities etc. Pony, with a little back-lighting. Passing by the houses, out of the sun - it looks cold! Icicles under a railway bridge where there is said to be a lion's head in the brickwork. The railway is the disused South Devon & Tavistock Railway that opened in 1859, supported by the Earl of Morley. It had six viaducts and three tunnels, and was extended from Tavistock to Lydford and Launceston in 1865. It was amalgamated into the GWR in 1878 and converted from broad gauge (7'¼") to standard gauge (4'8½") in 1892. It fell into decline after WW2 and was closed in 1962. Clearbrook Halt, 1928-1962, was opposite and below the Village Hall. Zoomed view of an icicle. Walking beside the River Meavy. 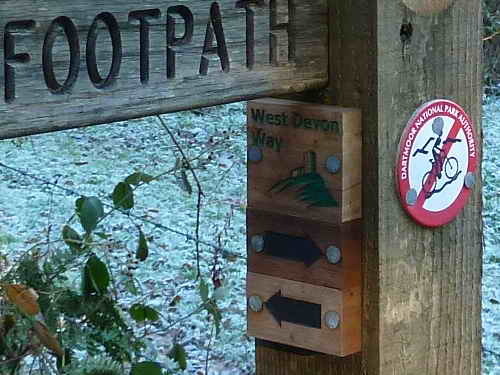 The main footpath is part of the West Devon Way. As previous photo ..... Consols means, essentially, something you put money into that will pay interest or dividends later. This mine started up with £60,000. Houses passed along the way. View of the path, taken into the sun. Sheep's Tor, also known as Shis Tor and Shepystor, SX 566 682, elevation 369 metres (1210 feet). ..... with Devonport Leat across the road. This leat supplied Devonport Dockyard and was opened in 1793, originally 27 miles long, coming from three rivers - the West Dart, Cowsic and Blackabrook. 17 miles of it are still flowing, now into Burrator Reservoir. Another view along the Devonport Leat. "It was the brainchild of Sir Thomas Tyrwhitt, who for more than twenty years tried to cultivate and populate the waste of Dartmoor. He built Prince's Town in the heart of the Moor and named it after the Prince of Wales, later to become King George IV. Sir Thomas persuaded the Admiralty that this place would make an ideal location for a depot to house prisoners from the war with France. As a result, he built Dartmoor Prison, competed in 1809, which for a few years housed 5,000 prisoners-of-war, until peace was declared in 1815. The buildings then lay deserted." . The railway was 25 miles long with a gauge of 4'6". It was Devon's first iron railway, opened Sep. 1823, with rails in chairs bolted onto granite sleeper blocks (setts). It declined in the 1840's, was sold to Princetown Railway Co. in 1883, and taken over by the GWR in 1921. A view along the road now on this section of the old railway. An explanatory notice, seen as a larger image HERE. Still more, although here they have either settled into the ground or the turf has gradually grown up around them. Peek Hill (left, masking Sharpitor), Leather Tor, Eylesbarrow (the wide area of high ground) and Sheep's Tor. Houses at Dousland can be seen in the mid-far distance. "North Wharf" - where breakfast for 1,000 people was served on the opening day of the Plymouth & Dartmoor Railway, on 26 Sep. 1823. Still known as Tyrwhitt's Wharf, this is where the tramway horses were changed, fed and stabled. (Source: Eric Hemery, Walking the Dartmoor Railroads, 1983, David & Charles, page 17). This photograph was meant to show the thickness of the ice but it hasn't really worked - some idea can be deduced by the shape of the grip on it. 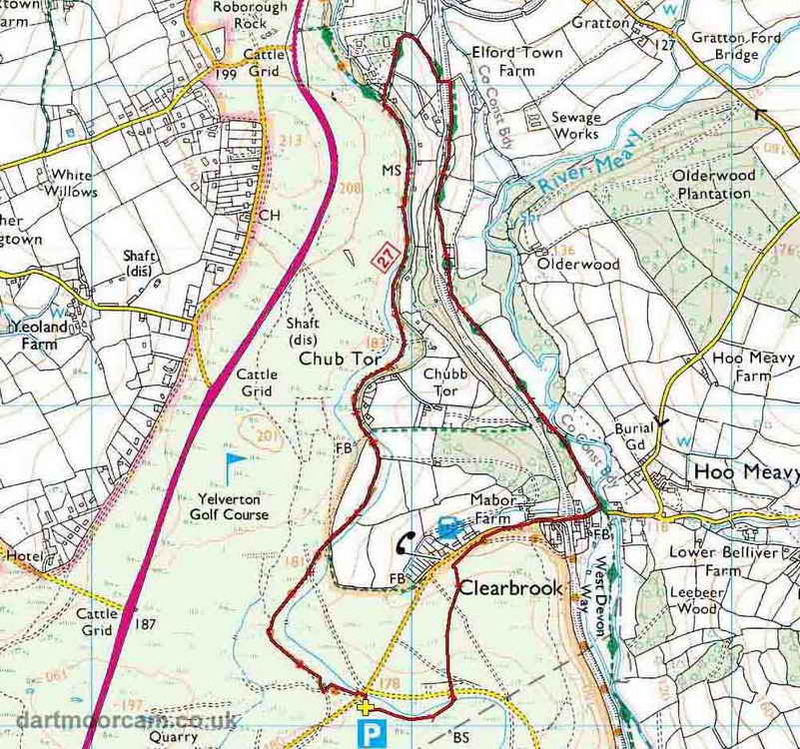 This walk was reached via the A386 from Roborough to Yelverton, turning off at the Clearbrook sign and parking at the yellow cross/ P symbol on the map, on the right just before the road goes over a small bridge that crosses the dry leat.